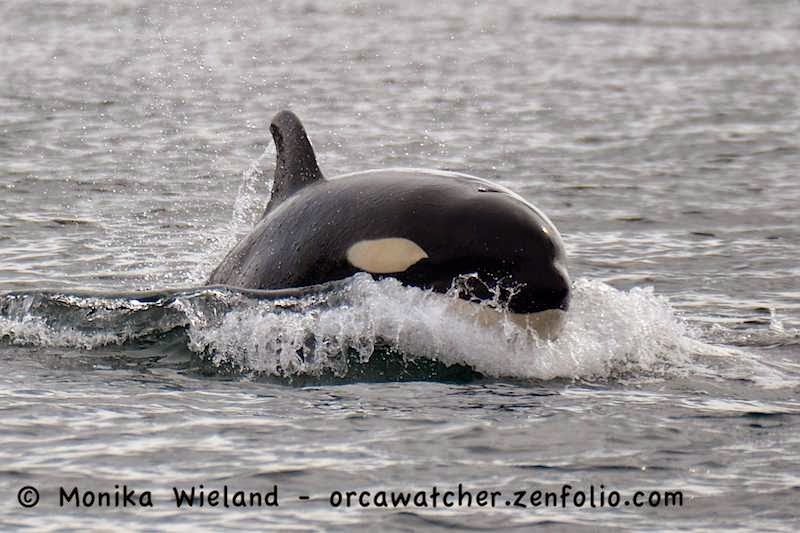 On March 30th we got the exciting news that another calf was spotted in J-Pod! 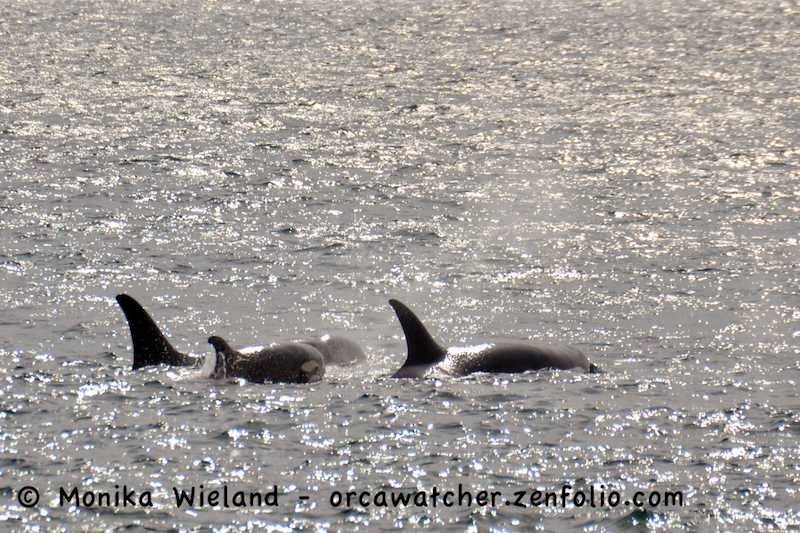 That means after going over two years without having a surviving calf born, we've had FOUR new little ones in the Southern Resident Community since the end of December (3 in J-Pod, 1 in L-Pod). If all the other whales have survived the winter, that will bring the population back up to 81 whales. 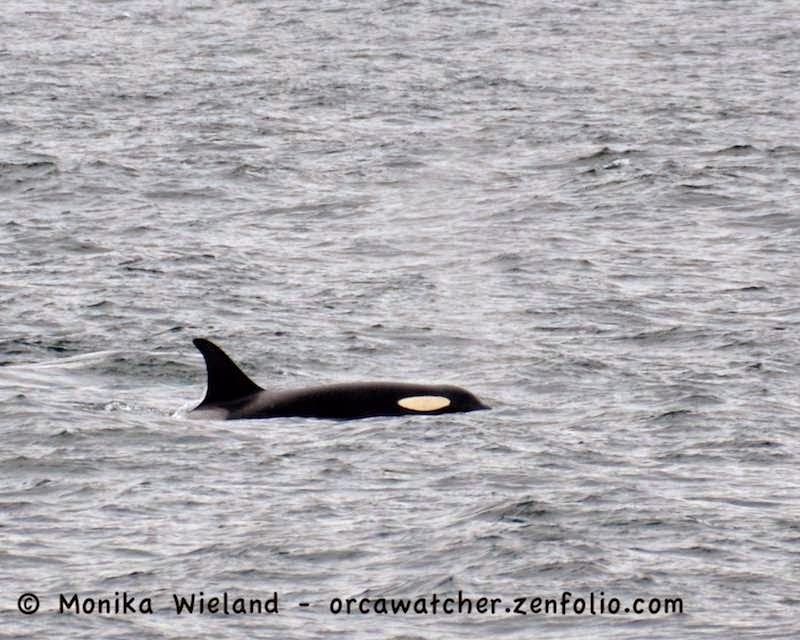 The new baby, designated J52, was traveling with the J16s and J40 on the first day it was seen. 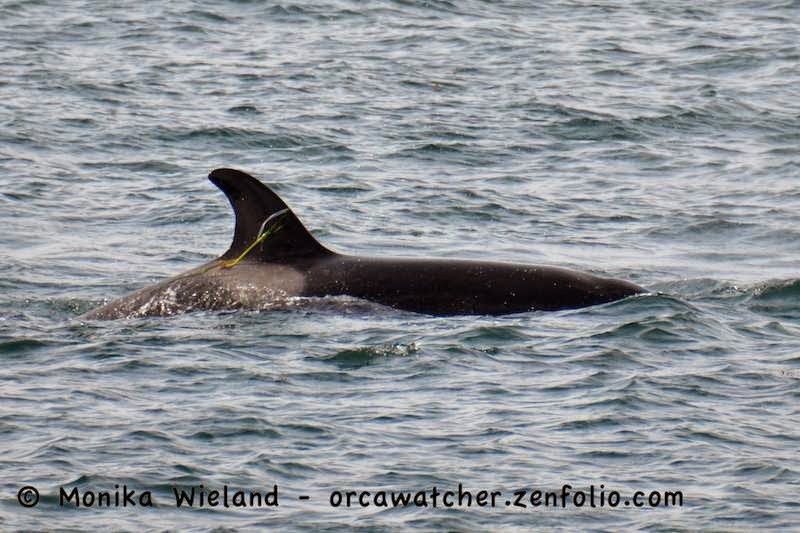 One of the whales it was traveling closest with with J16, but since she's the mom of another recent newborn in J50, we know she isn't the mom! Often it takes a few encounters to be sure who the mother is, as there can be a lot of helping out and/or babysitting in the early days after a whale's birth. 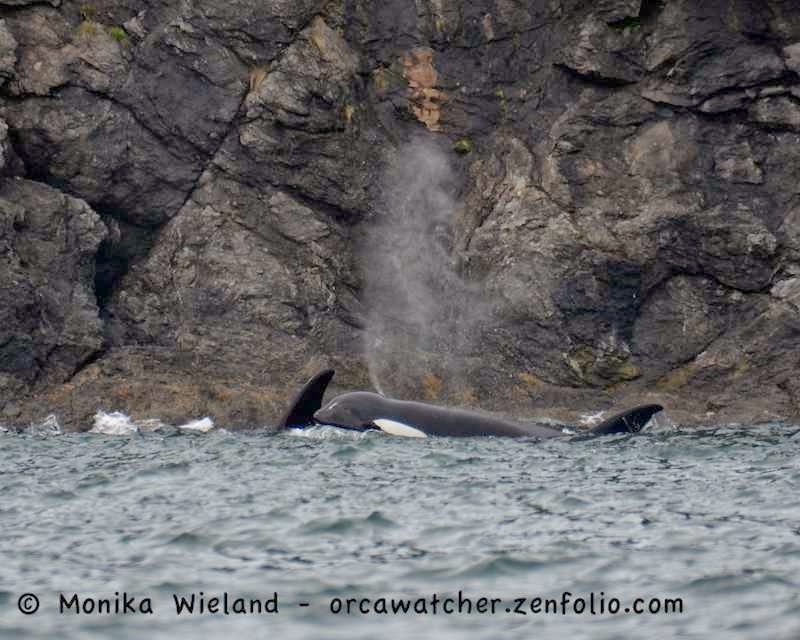 So for now, J52's mother remains a mystery! 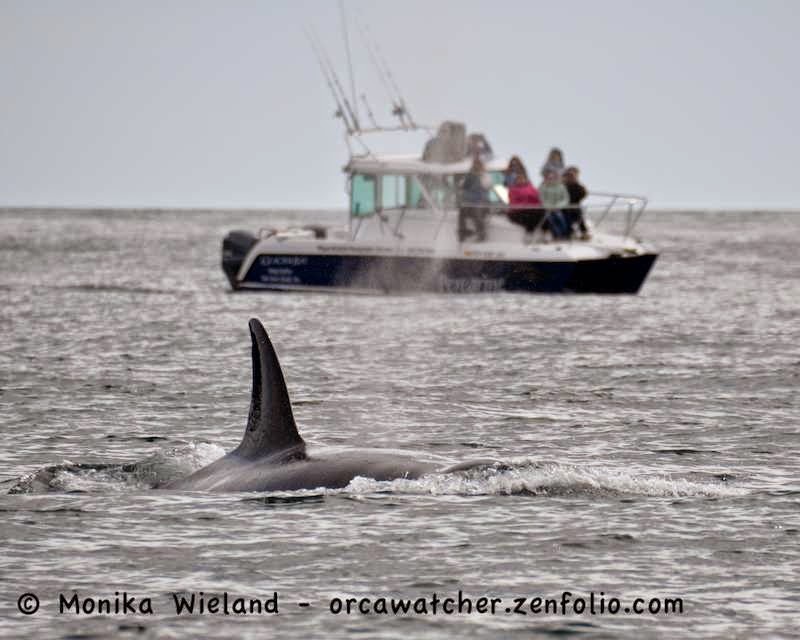 When word came of J-Pod heading back south towards San Juan Island on Friday, April 3rd, we were all anxious for word of J52 to see who he/she was traveling with. Unfortunately, viewing conditions weren't very good. Seas were rough, whales were spread, and dive times were long. 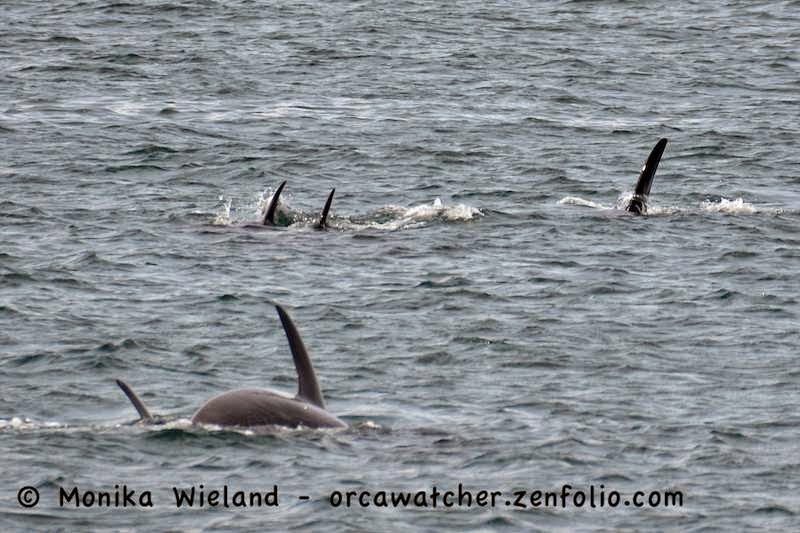 As a result, not all the J-Pod whales were encountered, and J52 was one of the ones missed. So the mystery will remain for a while longer! 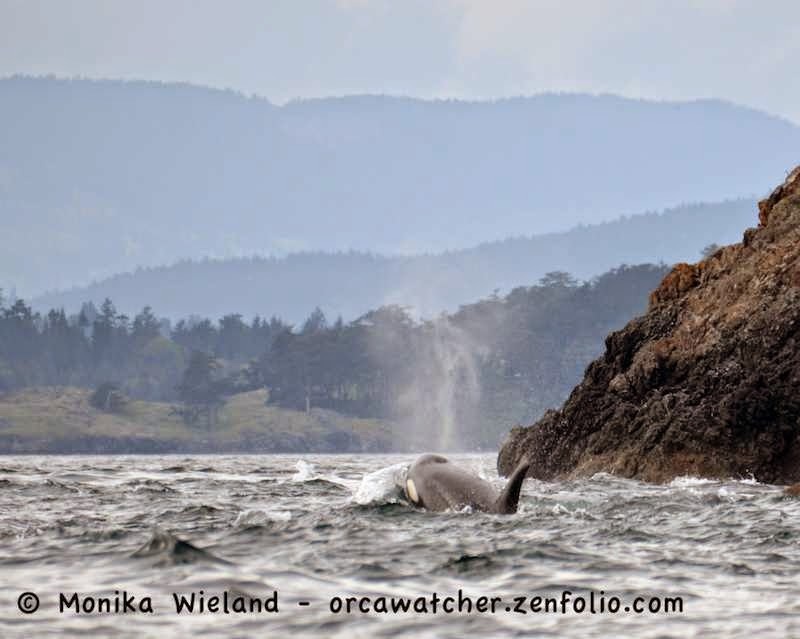 I was on shore at Lime Kiln, hoping some of the whales would come by closer to San Juan Island, as most of them were on the Canadian side of Haro Strait. I could see a lot of fins on the far side, but a couple did come closer - thank you J17 and J44! It looked like the whales were headed for the Strait of Juan de Fuca, so I wasn't too hopeful they would be around today, figuring they would probably go west. 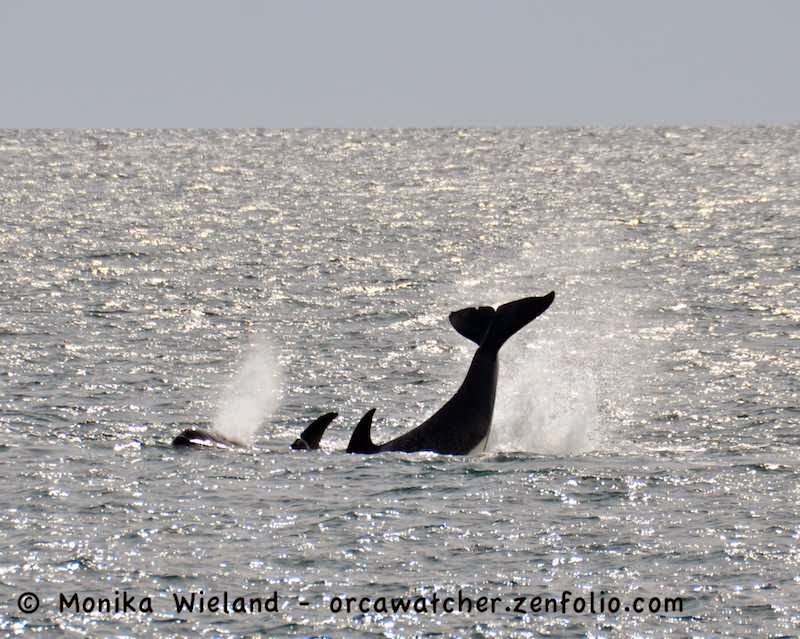 I had my fingers crossed for other whales to show up nearby, however, and they did! 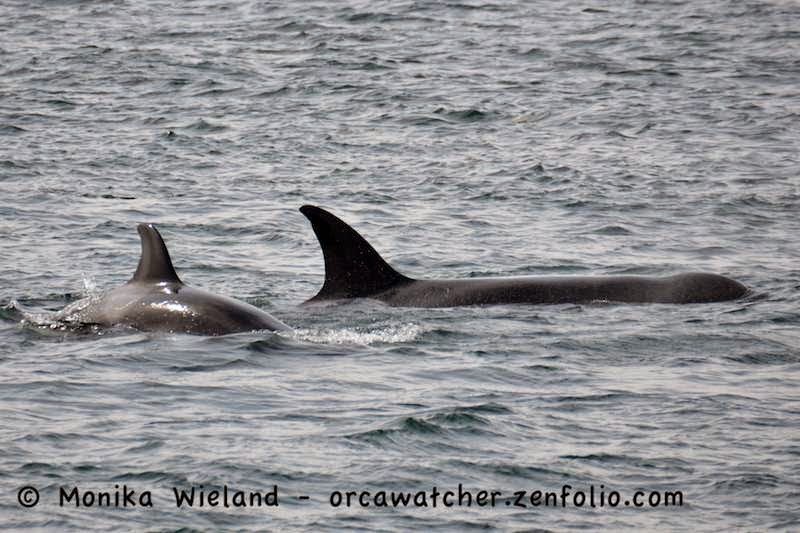 Thanks to a friend I heard about transients on the west side of San Juan Island. I got to Lime Kiln and saw several whale watch boats just offshore, so I ran down to the rocks and saw....nothing. 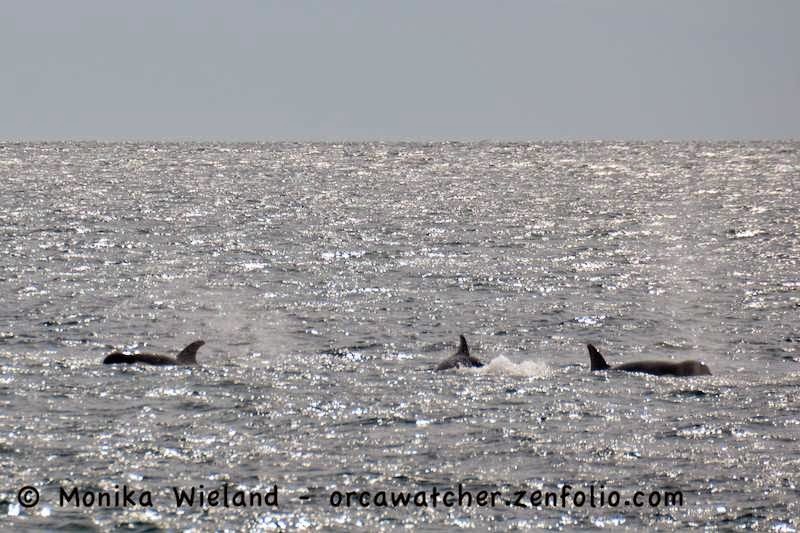 It took quite a few minutes of scanning before the whales finally popped up again. The whales were tightly circling a lot and doing lots of tailslapping, so I wondered if they had made a kill right before I arrived. 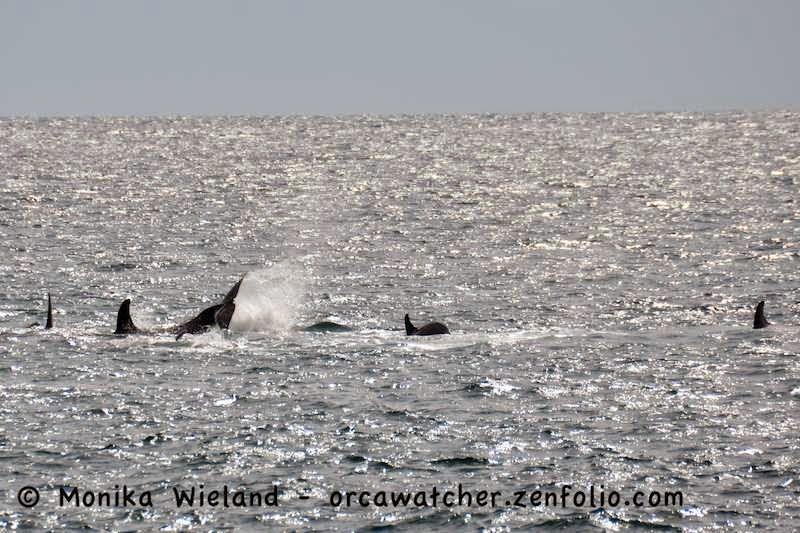 When the whales finally decided to start moving north again, they angled in towards the shoreline. 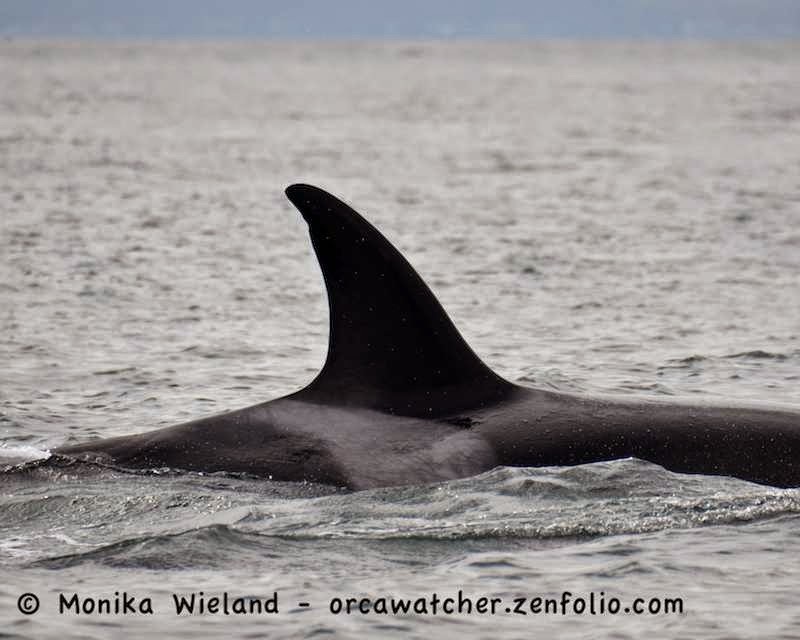 It's not too often you get the chance to see transients close from shore! I recognized the adult female, but I waited til I got home to check my ID guide to be sure....it was the T65As! This family group was around a lot last year, particularly in the spring, before making themselves scarce in the fall. Their littlest member, T65A5, was first seen in March of 2014. The family group is made up of mom T65A and her four surviving offspring. Because I had run down to the shoreline, I wasn't on my "usual" rock in front of the lighthouse. Bummer! 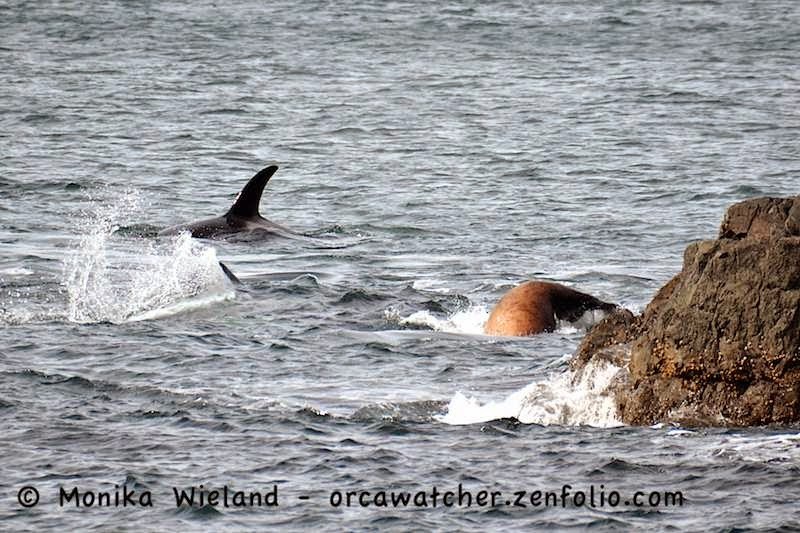 The whales went RIGHT in to this rock and harassed a Steller sea lion that was there! I can only imagine the photos I might have gotten had I been sitting in my usual spot, but it was still crazy impressive to see them lunging at the Steller! I'm not sure a female and four juveniles could take down a Steller....maybe, but not if it had the option of hauling out. 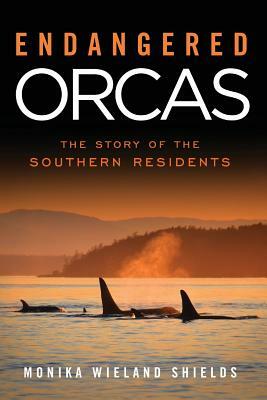 I think orcas usually like to take sea lions in open water. In any case, they didn't seem too serious about hunting this guy. It felt kind of like they swam up to him and went, "BOO!" just to make sure he was paying attention, before they continued on their way. It definitely gave the sea lion a fright, though. 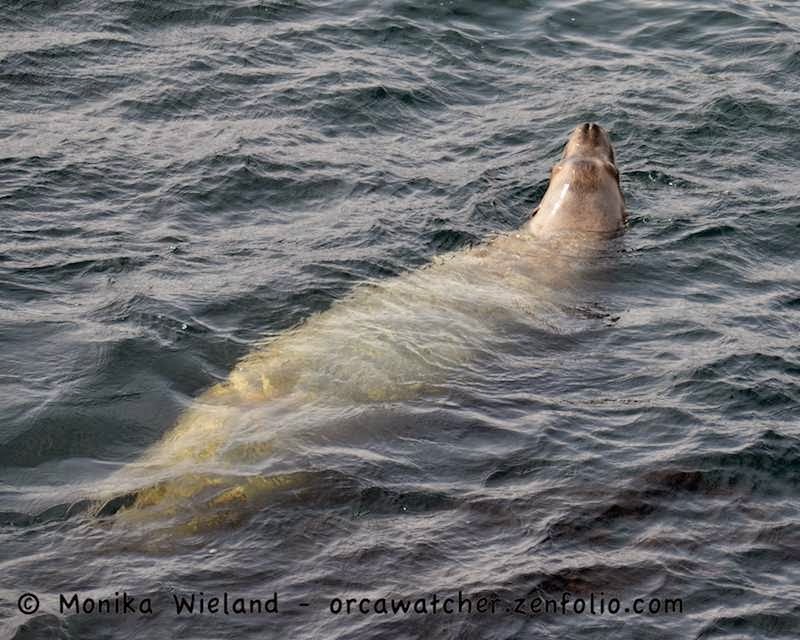 When I went down there, he was huffing and puffing on the surface, not taking his eyes off the receding whales. Seas still weren't the greatest, but with the whales heading right up the shoreline, I knew I had to try taking the boat out to see them. The timing was perfect to meet up with them for a few more minutes right at Open Bay. I was hanging back from all the whale-watching boats while the whales were on a long dive. Suddenly they popped up right in the middle of the fleet, and cruised right by us as we shutdown and let them pass. It never ceases to amaze me how BIG the whales look from our boat. I had to heavily crop this one to get a good look at that cute little face! They went in to Open Bay for a moment, then traveled along the edge of Henry Island. 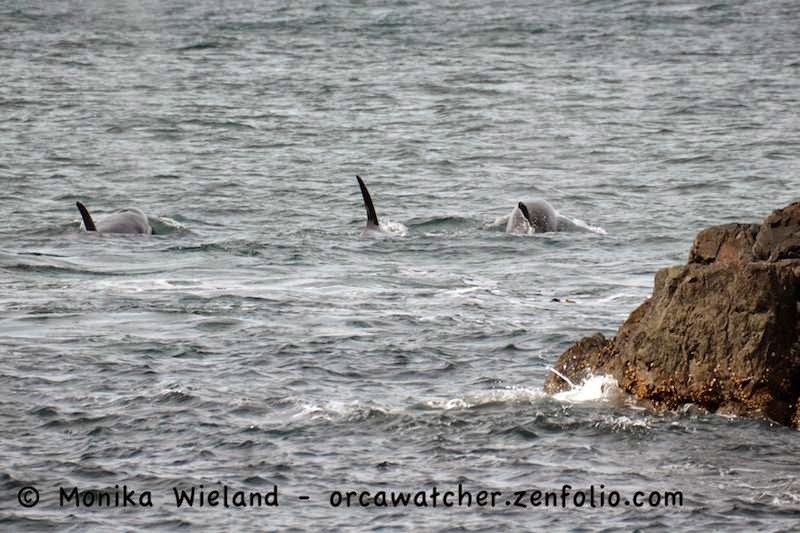 It also never ceases to amaze me how close to the rocks these whales will swim! With a decent swell, we decided to let them continue on their way and head back to port. The amazing spring sightings continue! Who or what will I see next?! Keep those amazing photos coming!